The Central Wisconsin Health Partnership (CWHP) is a consortium covering a six-county region including Adams, Green Lake, Juneau, Marquette, Waupaca, and Waushara Counties. The partnership includes county human services and public health departments, a Federally Qualified Health Center and other interested healthcare advocates and providers in the region. Senator Luther Olsen receives the 2018 Legislator of the Year Award from Kathy Munsey, Green Lake County Health Officer at a Central WI Health Partnership (CWHP) meeting on May 30, 2018 in Montello. CWHP members include Health and Human Services and Public Health staff from Adams, Juneau, Marquette, Green Lake, Waushara and Waupaca counties as well as Family Health La Clinica in Wautoma. The award was presented on behalf of the WI Public Health Association (WPHA) and the WI Association of Local Health Departments and Boards (WALHDAB). 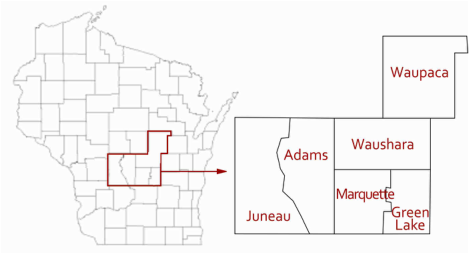 Senator Olsen serves the 14th Senate District, which covers portions of Adams, Columbia, Dane, Dodge, Fond du Lac, Green Lake, Marquette, Waupaca and Waushara counties. He served in the Wisconsin State Assembly from 1994-2002 and has been the Senator from the 14th District since 2004. Senator Olsen is the Chair of the Education Committee and the Legislative Council Study Committee on Property Tax Assessment Practices. He serves as Co-Chair of the Blue Ribbon Commission on School Funding and is the Vice-Chair of the budget-writing Joint Committee on Finance and the Committee on Public Benefits, Licensing and State-Federal Relations. He also serves on the Committee on Natural Resources and Energy. Senator Olsen is a champion for WPHA and WALHDAB and improving public health in Wisconsin. This session, he was the lead author on Senate Bill 242, which provided funding to local health departments to control and prevent the spread of communicable diseases. Senate Bill 242 received bipartisan support from legislators in urban, rural and suburban districts across Wisconsin. There was so much support for the bill, thanks in large part to Senator Olsen’s advocacy, that the bill was ultimately included in the 2017 – 2019 state budget that was signed into law in September 2017.